Several blog entries ago, I credited Hollywood films and TV shows with spurring my interest in history. Oddly enough, although I probably watched more Western movies and TV shows than anything else in my youth, they did not kick start any particular desire to read about the Old West. Most, if not all the books I bought in my teens and twenties were by subscription or book club choices. It was not until my late 30s that I began in earnest to purchase books on the Old West. But now they own and overflow that 11-foot long book shelf, the biggest one in the house. I’ll post later about the importance of the American Heritage Publishing Company to the early building of my library, but my first book on the West, at least that I still own, was a birthday or Christmas gift when I was ten. 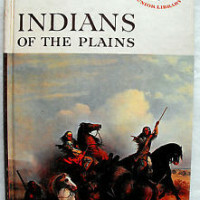 The volume was Indians of the Plains by Eugene Rachlis, my first American Heritage Junior Library volume. The volume did address plains Indian culture at a surface level, focusing on practices considered unusual by whites, but mainly stuck to the plains wars from the Sioux uprising of the 1860s until Wounded Knee. Rachlis’ text suffers from the usual early 60s stereotyping (“War was the Indian’s career and hobby, his work and his play.”), but it was nonetheless an exciting treatment. I read the book repeatedly (of course, since I owned fewer than ten history books at this time, I read them all repeatedly). Over the next three years, the AH Junior Library (AHJL) sent me a half dozen more profusely illustrated books on the eastern and trans-Mississippi frontiers: The California Gold Rush, Texas and the War with Mexico (the first of many Alamo books! ), Cowboys and Cattle Country, The French and Indian Wars, Westward on the Oregon Trail, and Adventures in the Wilderness. I’d seen movies on all of these subjects, but the “facts” as presented in these Anglo-centric accounts made me much more aware of the difficulties experienced by whites in settling the new lands. And, despite the bias typical for the age, they did not ignore the injustice experienced by the earlier native American and Tejano settlers. I gave up the AHJL subscription when I entered high school…. My limited funds were redirected to a new interest in European history and of course to social activities (girls and road trips). I did not purchase another book on the West until I graduated from college. During a solo driving trip from L.A. to Washington, D.C., I stopped in Tombstone, Arizona. At the Wyatt Earp museum in town I picked up John Myers Myers’ book, The Last Chance: Tombstone’s Early Years. In the decade since I had borrowed and read the library copy of Walter Noble Burns’s seminal Tombstone: Illiad of the Southwest, I had forgotten the complicated and dramatic story of the Earp-Cowboy conflict, which climaxed in lawman Earp’s unlawful, vengeance-filled vendetta ride. Another book I read over and over in the coming years. Coincidentally, it was at this time I began work on a French Revolution/Napoleon manuscript (still unpublished) that consumed my next 25 years. As fascinating as the Tombstone story was, I let it and the rest of the West slide out of my consciousness. Sixteen years and some 350 book purchases later, I was reintroduced to the Earp story. While wandering in the fiction section of a bookstore in Eugene, Oregon, I spied the iconic image of four determined looking gunmen walking abreast down a dusty Western street. The book was Loren Estleman’s novel, Bloody Season, which opens with Doc Holliday coughing up his lungs and hoping to live long enough to do what he needed to do. This OK Corral novel was intriguing in that Wyatt Earp, the central figure, was always front and center in other people’s thinking. His own mindset was elusive. An interesting approach. By 1989, I still owned only some two dozen books on the West, but half of them were on Tombstone and Cochise County, Arizona Territory. It would take another decade before I began to do my own primary research on the topic, but the seeds had been planted.